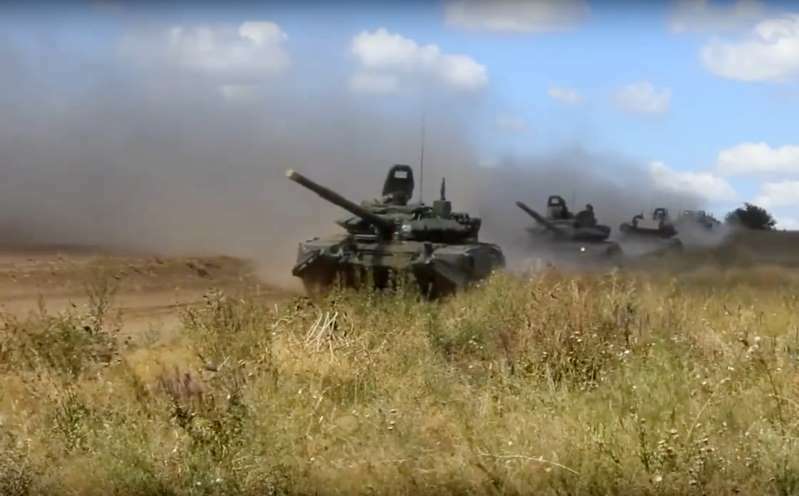 © AP/ In this photo taken from video provided by Russian Defense Ministry Press Service on Tuesday, Sept. 11, 2018, tanks roll during the military exercises in the Chita region, Eastern Siberia, during the Vostok 2018 exercises in Russia. From this Pacific port to a Siberian training range 900 miles away, China and Russia sent an unambiguous message to Washington on Tuesday: Under American pressure, these historical rivals are becoming allies. In Vladivostok, Russian President Vladimir Putin welcomed Chinese President Xi Jinping as the headline guest at an annual conference focused on Russia’s Far East. They made pancakes together on the waterfront. Meanwhile in Siberia, more than 3,000 Chinese troops joined Russian soldiers for the country’s biggest military drills since the Soviet era. China and Russia regularly cooperate in bilateral exercises. But this is the first time that Moscow has integrated Chinese forces into its annual strategic exercises typically reserved for Russia’s closest allies: drones, paratroopers, artillery and warplanes deployed in mock battles. This year’s Vostok (“east”) drills have been billed by the Russian military as the biggest since 1981, involving about 300,000 Russian service members, more than 1,000 aircraft, 36,000 tanks and scores of ships over the next week. The addition of the Chinese units underscores a potentially major shift: Two countries that had long considered each other potential military adversaries are now partners in confronting the United States. “Both countries are trying to signal: If the United States pushes too far, we are going to move closer to each other,” said Alexander Gabuev, chairman of the Russia in the Asia-Pacific Program at the Carnegie Moscow Center think tank. China’s mounting tensions with Washington have raised the value — in Beijing’s eyes — of Russia’s military technology and experience, analysts say. For Putin, Western sanctions are making China’s economic might more attractive as he searches for new allies. The deepening military bond between Moscow and Beijing, analysts say, gives China valuable access to Russian military technology and Russia’s field experience in Syria and Ukraine. Russia in recent years started selling China some of its most advanced weapons, including the S-400 surface-to-air missile system and Su-35 fourth-generation fighter jet. Such sales had been hindered in the past by Moscow’s worries that China was a potential adversary and that it would steal the technology. But amid Russia’s conflict with the West, those worries have mostly dissipated. “There’s no question that international tensions have contributed to the tightening of Russian-Chinese bonds,” Russian Defense Minister Sergei Shoigu said in July. Few expect Russia and China to enter a formal alliance akin to NATO. But the two countries are sending a signal that they could partner up in a military entente in the event of a confrontation with Washington in which their interests align. Chinese officials generally shy away from open talk of joining forces with Russia against the United States. But in the lead-up to Xi’s trip to Vladivostok, China’s state-run media was full of effusive commentary lauding the relationship between Moscow and Beijing. Bilateral trade is booming — it is expected to cross $100 billion this year, up from $84 billion last year — and the countries are deepening their economic cooperation. Russia could supply its neighbor with energy, while China could share its expertise in ­e-commerce, analysts said. Such cooperation is especially important in the current international environment, they said, hinting at President Trump’s protectionism. Chinese e-commerce giant Alibaba said Tuesday that it would partner with a prominent Russian oligarch and the Russian sovereign wealth fund to expand into Russia. Feng Yujun, director of the Center for Russian and Central Asian Studies at Fudan University in Shanghai, said the geopolitical aims of the two countries do not coincide. China is trying to integrate itself into the established international order and promote globalization, he said, while Russia is not willing to obey the established order. In Vladivostok on Tuesday, Xi gave Putin a boost by bringing a delegation of nearly 1,000 Chinese businesspeople and officials to the Eastern Economic Forum, a Putin-led effort to lure foreign investment to Russia’s remote Asian reaches. After hours of talks, Putin took Xi to the Sea of Japan (East Sea) waterfront, where the presidents cooked blini: thin Russian pancakes. China is also seeing benefits from the deepening relationship. Russian officials have said that the war games this week — which will include Russian, Chinese and Mongolian soldiers fighting a separate contingent of Russian soldiers in mock battle — will feature lessons of Russia’s engagement in Syria. Participating in the exercises “will increase the abilities of our armed forces to counter threats to our security and also to learn from the invaluable military experience of the Russian side,” Kui Yanwei, China’s military attache to Russia, said at a briefing at the Defense Ministry in Moscow last week. Critics of the Trump administration’s national security strategy say that by grouping an overtly hostile Russia with a less aggressive China, Washington risks driving them toward greater cooperation against the United States. But Defense Secretary Jim Mattis played down the prospects. Kofman, the CNA researcher, cautioned that lingering tensions between Russia and China shouldn’t lead to conclusions that they won’t cooperate militarily in the future. He noted that they could act together against the United States in an arrangement that falls short of a formal, on-paper alliance. “Throughout history, great powers have allied with one another against common threats out of necessity, not necessarily because they share values or ultimate aims,” Kofman said. Fifield reported from Beijing. Sonne reported from Washington. Yang Liu in Beijing contributed to this report.